It is perhaps with a degree of historical poetry that on the cusp of an apparent Iranian nuclear deal that Japan should celebrate the 70th anniversary of the destruction of two of its cities at the hands of the United States. The very self-appointed arbitrator that decides, who may and may not possess nuclear technologies in the modern age. It was after all, the United States that despite destroying two cities with such devices considered using more nuclear weapons in its Korean and Vietnam operations against other Asian peoples. It was the United States’ premier ally, Israel, who contemplated using tactical nukes during its desperate hours in October 1973 when it seemed that defeat was approaching at the hands of its Arab foes. And though many nations that do have nuclear devices have celebrated such status by blasting swathes of this Earth apart with them, it has only been the United States which has done so on large concentrations of civilians. 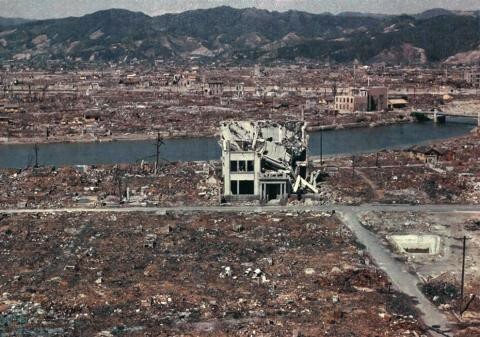 Often it is cited that the nuclear destruction of Hiroshima and Nagasaki was needed to bring Japan to her knees. But outside of popular mythology and official depictions made thereafter this folklore is untrue. Japan had been defeated by this stage of the War and while her people may have fought a desperate defence of their homeland, most knew that it was a hopeless situation Which is why negotiations for surrender were attempted by the Japanese. It was with the Soviet declaration of war against Japan, after the expiration of the 1939 non-aggression treaty. The Soviet entry into the war on Japan was by far a more frightening ordeal to those in Tokyo. Although Japan had a large army in Manchuria, Korea and North China, a predominately land force geared to fighting a past war. An army that had struggled in 1939 against the Soviet Union. Unlike the USSR, Japan had not evolved in modern land warfare and with its new war machines born in the bloody battles of the Eastern (to them a Western Front) front the Soviet armies steeled with experience wiped away the large but poorly armed and tactically inept force of Japan that stood before them. It was because of the sudden gains made by the Soviets in East Asia, at the expense of the Japanese Empire, that the United States felt a greater urgency in showcasing its new ‘toys’. One that could counter balance the Soviet supremacy in men and material, one that could tip the balance for the Western powers for a time and it seemed that the unimportant citizenry of Japan would make a good test subject for the execution of such weapons. Just as the many German civilians had in the last days in Europe’s war when with massive allied bomber missions the Western powers decimated the cities of Dresden and Hamburg to show the advancing Soviet armies just how mighty Allied air power was. Now it seemed that with the Fat Man and Little Boy atomic bombs, the United States had the ultimate trump card in destructive strategic air power. And so, in early August 1945 thousands of lives were snuffed out almost instantly. Though it was not new for the warring nations to take massive amounts of civilian lives, doing so with a single bomb however was. The choice of the cities had been determined on how untouched that they had been from previous allied mass bombings. An untouched city with a high concentration of civilian lives that also had a lack of cloud coverage over the target, were integral factors. 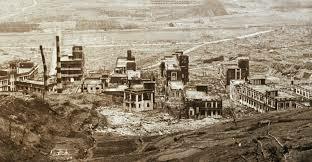 Nagasaki was chosen an hour before its destruction for example. And though the mass bombing against both the Germans and Japanese had been argued as being ineffective in stemming their industrial output, the blood lust and hunger to destroy human lives on national grounds continued until the wars end, the two Bombs being the perfect testament to this. Japan had been seeking negotiations for surrender before the bomb, but it seemed the decision had been made from to drop the bomb had already been determined. As soon as the Los Alamos test explosion in July 1945 had been achieved, Japan the remaining pariah nation for the United States would suffer the new device’s fury. President Truman and his administration had little compassion or empathy for the Japanese people and like many, even to this day, viewed them ALL as antagonists and fair game. Whether a babe in a crib or an elderly person with dementia all Japanese were legitimate targets because of their government’s policy. And thus, should be condemned to the most savage and terrifying of deaths. Much information after the war was kept quiet about the allied bombing efforts and especially the nasty nature of the two bombs. Especially the post detonation misery experienced by those with burns and radiation sickness. So many at home in the safety of the United States and her Allied nations understood little of the true perversity of such bombings. It is even years after and with somewhat nationalistic conviction, that many view the enemies of the war era with such venom. Even for those unborn in this period of war and propaganda it is still with an obedience to officialdom that many offhandedly repeat mantras worthy of a Joseph Goebbels broadcast. Statements such as, ‘they deserved it for what they did in Nangking’, ‘they all would have fought to the last anyway’ or, ‘we saved more lives by dropping the bombs than if we had invaded’ and so on. Such simplistic and absolute comments that illustrate a savagery of mind that can only come about through cookie cut education, nationalism and a lack of empathy to any other human outside of one’s own nation state. The Japanese armies conduct in Nangking was certainly savage and terrible, that is not in dispute. Neither are the many other Japanese incited atrocities committed against civilians and prisoners of war, these many official acts of terror are well recorded and depict a militant regime of savage character. And despite these many well-known actions of horrific conduct, should those who attempt to balance out such evil conduct themselves with just as much evil? A Japanese child is not responsible for the determinations of the national government that ruled over it, nor is the same child responsible for the rapes, murder, torture and militant aggression exhibited by the Japanese Army during World War two. No child is. And should the avenging allied angels with calculations based upon cold hearted strategy decide that a city full of innocent civilians should be condemned to punish their national leaders then so be it, per the victorious pages of history. And as tremendously efficient at democide as the Japanese government was, it was outdone by the United States in this period who managed to destroy more lives both civil and military. Not to mention the mighty slayer of humanity the Soviet Union which had killed millions before the war started let alone during and after it. It is morbid to bring in body counts and that is not the point. The point is this; how can one consider a nation themselves righteous and good if they do very much the same as those who are condemned as being evil? If the Japanese atrocities should be warrant enough to validate the firebombing and atomic bombing of its cities does this then mean that the savage genocide inflicted on native Americans during the 19th century alone would also justify a nation at that time, if they had the power, to destroy American cities? Or if the Japanese enslavement of thousands in its colonies was testimony to a culture of viciousness, how was it any different to the slavery and Jim Crow policies enforced by the United States? Was the mistreatment of its recently acquired colonial peoples different to those of the Allies, but especially the United States? It is not about comparing who is the most savage government or which nation has the most blood-stained history. The point is that many in the West can differentiate between those who conduct savagery in their name and the ignorant innocence at home. And yet when it comes to their enemies, such a separation between a murderous uniformed agent of the state and a two-day old babe is never made. It is why in the many wars everlasting since the bombings of the cities of World War Two and beyond, that the ‘good guys’ continue to murder children and citizens with very little consideration or regard and thus merely relegate them at best as being unintentional casualties or fair game simply because of birth right. The arguments that Japan would have fought to the very last is an abstract assumption which only gained greater popularity with subsequent exaggerations in official memoirs. In the years following the war and the two bombs the number of allied casualties estimated to have died in an invasion of Japan has gone from hundreds of thousands to millions. In each depiction of the need to drop the bomb and the apparent expedience for its usage, the allied dead are tallied up in imagined statistics, yet the approaching Soviet military from Asia is never mentioned or discussed. Japanese communiqués that were intercepted and captured mention that it is the approaching Soviet military which was feared by the Japanese officials as they considered their helpless position with as much desperation as the Allied naval armada and air forces which sat menacingly near the isolated nation. So, while many will view the two examples of murder at the hands of Atom bombs as being a positive or a necessity we can see an ever-ongoing saga of human serpic lust for mass destruction. This vacant association of human misery and obligation, a helpless observance of the zeitgeist however bloody that it may be and a simplistic nod to any authority so long as it is familiar and proclaims a homely altruism, will continue to rob those foreign of life and dignity so long as they somehow find themselves in ‘opposition’. This can engender both obedience, even over time when conversation should be encouraged. Unfortunately for most contrary opinions are viewed to be dangerously seditious or socially impolite as though the mass murder of innocent human beings by one’s own national government is something to be proud of and not interested in preventing from ever happening again. And so, with this we can always see somewhat good people very easily condoning terrifying things and apathetic individuals so easily participating in mass slaughter. So, while the war for many was apparently fought to defeat Nazism and its genocidal tendencies against the Jews, Gypsies, Communists, Anarchists and so on. It is with the same ultimate outcome that many were sent to a fiery inferno simply because of where they were born. Judgement is so easily made against the brutal Nazis for their atrocious death camps but turning entire cities into hellish infernos of death because an entire people were condemned as being pariah by another people is considered as being culturally valid. Cities deemed as targets simply upon the determinations of a war council are viewed as stepping stones to a victory and remembered with elegant romance, but those passing the Nuremberg laws sealing the fate of millions of Jews are passed off as being inhuman murderers. Is murder not murder? What makes one act of mass democide palpable in the minds of the populace, whereas another so terrible? When in fact all are tragically despicable. In the decades after the wars in Korea and then South East Asia, after all those millions of tonnes of chemicals, explosives and shards of deadly metal were dropped intentionally upon the civilians in those regions, what was to be gained? The objective mass bombings of millions of human beings who have not wronged their killer is considered with such limited thought by many of those who continue to see joy in bombarding another group of different strangers. Japan was defeated in 1945 and that end could be argued to justify the explosive bloody means, per popular perspective. What justifications could be had in subsequent bombing campaigns on peoples and nations, many who are not even in a state of war with the United States or its allies? Bombs, missiles, artillery shells and rockets have been lobbed, fired and dropped by far too many national governments upon the unarmed and innocent peoples that they view as enemy. The millions of dead are horrific. Many of the offending nations and groups can see a moral legitimacy in their cause and thus manage to derive some pragmatic virtue out of the violent murder. It can always be justified it seems. Terror cells fighting for national liberation, communist student terror groups, theocratic national governments, communist dictatorships, liberal western democracies or even the United Nations, all can legitimise through legalese, belief and ideals the murder of innocent human beings. It is found within the hypocrisy of those nations that fight so many wars in their own self-interest and claim to be on the side of supreme virtue. In the end, however, the dead remain dead and the bereaved forever mourning. And so, as many mourn the distant dead in Nagasaki and Hiroshima with a symbolic tear for the past, we should perhaps consider the millions murdered not just by the two bombs but by all bombs that were knowingly dropped on civilians. Bombs dropped in the name of strategic attrition aimed to inflict maximum harm to a populace. It takes governance to view individual human beings as mere resources and possessions of another government. It is then with such a legal mandate that so simply misery can be doled out to millions upon millions. The victims shall forever be forgotten as a footnote in some political or war master’s memoirs, as perhaps at best a regret or worse an important means to teach some government or entity a lesson at the expense of innocence. While the radiation still lingers, the ruins continue to haunt and the dead’s shadows fade so shall the same mindset last eternally and so shall the same pollution of human arrogance continue to celebrate the folly that is mass murder under the banner of noble warfare.